I've always been very meticulous when it comes to taking care of my family. I guess most moms are like me especially when they are dealing with their kids' own health. With my Kyle, I don't usually just give him what I consider as "self-medicated medicines" or any "over-the-counter" available medicine there is. Instead, I'd rather have him checked by his pediatrician and if there's some products I'd like to try, I'd ask his physician if it's ok. If he gives it a thumbs-up, that's the only time I'd go for it. Recently, Kyle came home from school somewhat sniffing with a cough. Well, I don't know if it was just a simple case of coincidence, I've just picked up a few items for a product review of Lagundex. So I immediately called on Kyle's pediatrician and he said I could make Kyle take Lagundex syrup to treat his cough. 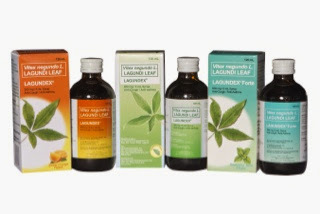 For those who aren't familiar with it yet, Lagundex is a brand of Lagundi leaf (Vitex negundo L.), based natural medicine/herbal product extensively studied and trusted by the Department of Health. It is also guaranteed safe as it strictly complies with the manufacturing standards of the Philippine Food and Drug Administration. It is manufactured under Good Manufacturing Practice (GMP) with certified facilities to ensure its quality and efficacy. Lagundex was developed by a group of Filipino scientists, it gives an assurance that it only uses indigenous lagundi (Vitex negundo L.) plants, making it truly and proudly Filipino-made product. Going back to Kyle's cough, he's usually the type who couldn't sleep well each time he has a cough. But upon taking Lagundex syrup, I was surprised he was able to have a good night sleep sans any cough interrupting him. What I also love about Kyle taking natural and herbal based medicine like Lagundex is the fact that it is non-drowsy. Other chemical based medicines we've previously tried would make him a sleepy head at school. But certainly, that's not the case with Lagundex because it's all-natural. Plus, Kyle loved its taste as well, its got none of those bitter medicines that even has an after-taste. You know as a mom, those little details sometimes make things a bit difficult for us--like if our kids had to take on medicines that do not taste good enough for them to swallow. With Lagundex, you can be assured that it has a kid-friendly taste so taking medicines will no longer be a problem for you. 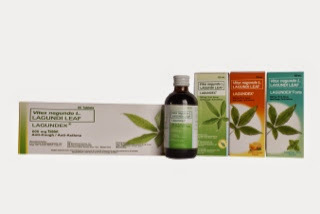 Lagundex 300 mg/5 mL syrup comes in sweet orange and peppermint flavors suited for kids, while the Lagundex Forte 600 mg/5 mL syrup in soothing mint flavor and Lagundex 600 mg tablet are ideal for adults. All these are available in leading drugstores nationwide. I'm happy that in just a few days of taking Lagundex, Kyle's cough was able to clear up. We have personally proven that Lagundex as a safe and effective natural remedy for cough (in both kids and adult). Nothing really beats mother nature's gift of herbal medicines. We're blessed that in this day and age, we no longer had to resort to the old ways of harvesting lagundi leaves, boiling them before we can drink them. Now, you can just go to any drugstore and ask for Lagundex syrup or tablet--truly, very convenient indeed! Lagundex is distributed by New Marketlink Pharmaceutical Corporation (NMPC). For more information, ask your doctor about Lagundex or call NMPC hotlines at (02) 836-5838 to 47. Disclaimer: Please note that what I have shared should not take place of an actual visit to your physician. It's always best to consult and see your doctor. I am not compensated for this post. Opinions expressed are my own.